Are You Struggling To Get Clients & Make Sales In Your Business? Hey, there!!! My name is Shalena D.I.V.A. Broaster. I am a global life and business coach. I know what it's like to struggle financially in my business. When I first started my business I was afraid to charge and wondered why I wasn't bringing in any money. I was also afraid of people telling me "No" when I told them my prices. I was plain 'ole scared to put myself out there to even let people know that I was in business. As a result, I struggled financially in my business. It was frustrating because I knew I was talented, competent and able to help people get results. I just didn't know how to get clients. If you can relate to what I'm saying, then I have some good news. Keep reading. Back in 2012, I left a toxic 6 year relationship. In one day I became homeless and jobless in 1 day because I lived with and worked for my fiance. For 2 years I stayed with various family members. Sometimes I slept on floors and couches. However, a ray of hope appeared when I was invited to speak at a teen girls empowerment day. I was used to working with women, but to my surprise, I LOVED conducting those workshops and the girls loved me. I didn't know it, but the CEO of a local charter school company sat sat in on my workshop and loved it, too. After the workshop, she asked me to come to her school and empower her girls. I thought they simply wanted me to come and conduct more free workshops. I didn't mind, but I was broke and homeless. I needed money. However, she sent an email asking me for my fee and a proposal. I was shocked! They were trying to pay me. I whipped up a proposal and sent it. I was trembling because I was so nervous.... what if they said "No." Well... the school accepted my proposal for $2,500!!! That contract eventually turned into $4,000. You don't understand what this meant for me. I could stop living from pillar to post. I could get off my mama's couch. For the first time in a long time, I felt like I was in control of my destiny. Getting my first client was such an amazing feeling. Although I was homeless when I landed my first client, I was positioned for success. During the years and months leading up to my chance encounter with the school CEO, I had been building my platform and showcasing my abilities. I GOT IN FRONT OF MY IDEAL CLIENTS AND BLEW THEM AWAY!!! I like to think of the 3 free workshops I conducted as my AUDITION. How Can I Help You To Get Your First Client? When I look back on how and why that client sought me out and was eager to pay me, I realize that I did many things correctly. Now don't beat yourself up if you may be lacking some of these things. You can position yourself to win by checking all of these things off your list. Let me teach you how to position yourself for similar success. The Get Your First Client 30 Day Boot Camp!!! I am conducting a 30 Day get Your First Client Boot Camp!!! You will achieve all of this in 30 days because YOU MUST conduct a live in person workshop or live webinar before the 30 days is over. Here's the kicker, you can't spend any money on making this happen except for a small exception for the live in person workshops. After you conduct your free workshop or webinar and follow the rules, you will be positioned to get clients because... you will finally be set up for success!!! What Do You Receive In This 30 Day Boot Camp? 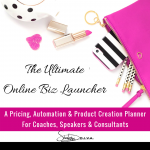 a free digital PDF copy of "The Ultimate Online Biz Launcher." It will help you to: find your niche, create products & revenue streams, identify ideal clients & find automation tools. Who Is The 30 Day Get Your First Client Boot Camp For? Someone who wants to finally stop being broke and learn how to earn. money in their business. Someone who is hungry and teachable. Someone who will take actions even if they are uncomfortable and scared. Someone who wants to get out there and DO THE WORK. Someone who is willing to trust the process. Someone who is ready to be supported, but not babied into taking action. Although the boot camp officially begins on June 24, 2018, you can join now. You will receive pre-work to help you MAXIMIZE your 30 day experience. You will be given the 30 days to complete the challenge. However, realize that others who started before you will have accomplished more than you. Do not allow this to discourage you. Run your own race.